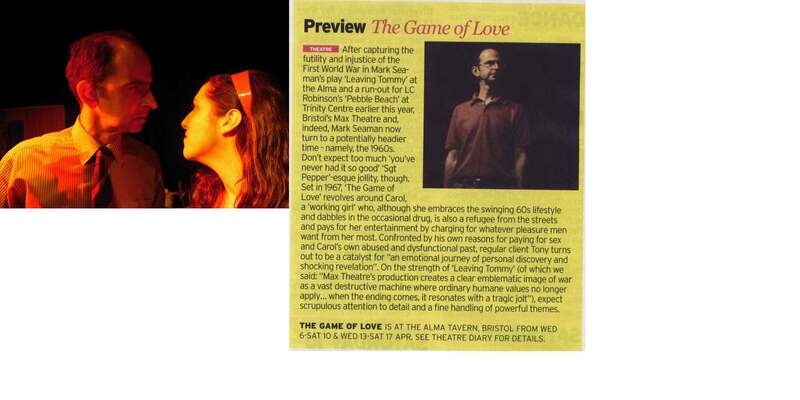 Mark also explores the sensitive nature of a tortured relationship between a working girl and her client in “The Game of Love,” set in the swinging sixties. “Sarah” is a story that touches on a young girl’s decent into depression and despair. “You and Me Makes Three” exposes the raw nerve of betrayal between three friends, while “Family Ties” is a full length piece dealing with the tensions between a seemingly close knit family when a destructive revelation threatens to tear them apart. "Without Trace", is a one act play that tells the story of sixteen year old Amy Mason who goes missing from home. Is it just the rebelling of a frustrated teenager that has led to Amy's leaving, or is there a more sinister reason for her disappearance? Other work available directly from Mark through this site include, “Bench Marks,” “Stages of the Heart”. See below for further details of how to contact Mark about his scripts and for a synopsis of his plays. 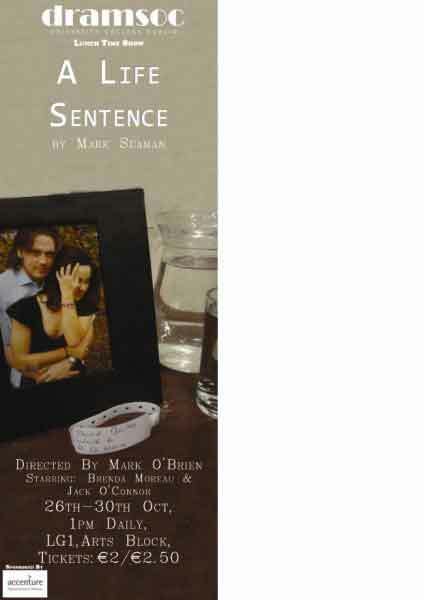 A Life Sentence: A one act play and love story depicting the emotional challenges and eventual loss facing a family touched by Dementia. This moving two hander featuring a husband and wife, both in their mid-late Fifties, has won no fewer than eleven awards at various Festivals, including “Festival Winner”, “Best Original Play”, “Best Director” along with “Best Actor” and “Best Actress” awards. It was also invited, as one of only six plays, to appear at the prestigious National Drama Festivals Association’s 35th British All Winners Festival. Here it was staged alongside other work by such luminaries as “Arthur Miller”, “John Godber” and “Harold Pinter”. President of the Association that year was Sir Derek Jacobi. Mark directed this play at all the performances. 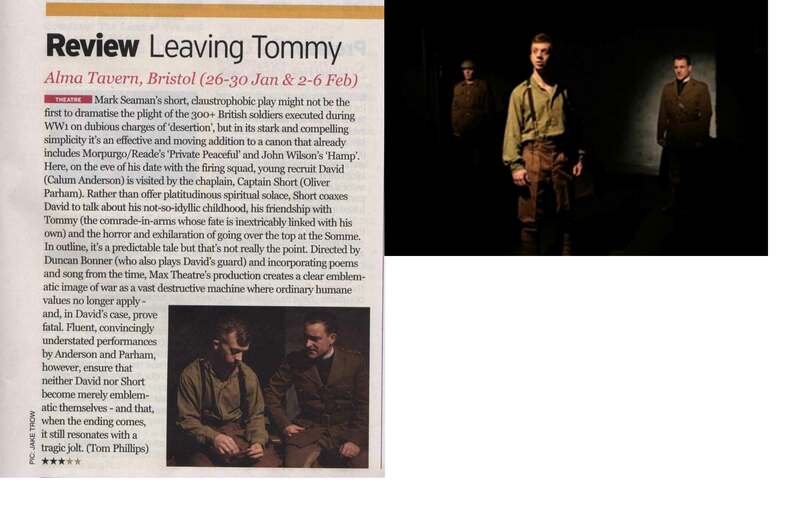 Leaving Tommy: The drama takes place in a Military prison cell with Seventeen year old Private David Reece awaiting execution for desertion from the front line on July 16th 1916, the opening day of The Battle of the Somme. David is alone in his cell with under an hour until his execution when he is visited by the Army Chaplain. David is accused of deserting his best friend and fellow troop members, but David’s account of events is very different. Can his time with the Chaplain prove enough to save his young life? This fictitious and harrowing one act play and story is based on real events, and again picked up a number of awards for its three actors, including, “Festival Winner”, “Best Original Play”, “Best Director” and “Best Actor”. It was recently performed professionally at The Alma Tavern Theatre in Clifton Bristol, and received a glowing review in “Venue Magazine”. Mark directed this play at all the Festival performances, and it was directed by the respected Bristol based actor and director Duncan Bonner at The Alma Tavern. Stages of the Heart: A one act play depicting the shared laughter, secrets, emotion and eventual loss in a relationship spanning fifty years. The action is set in a West Country seaside restaurant where the central characters Ted and Violet have returned every ten years following their original visit during their honeymoon at the start of the Second World War. Ted has chosen this anniversary visit to confess a terrible truth to Violet, but has he left it too late? Another award winning play for Mark, with Stages of the Heart picking up Seven awards, again including, “Festival Winner”, “Best Original Play”, “Best Director” and a richly deserved “Best Actor Award” for the central character of Ted. Mark directed this play at all Festival performances. The Game of Love: “Working girl”, Carol and her client Tony embark on an emotional journey of personal discovery and revelation between these two very different individuals. This full length one act play challenges its audience to think again about the often stylised view of prostitution and of those who use the services of the “Working girl”? 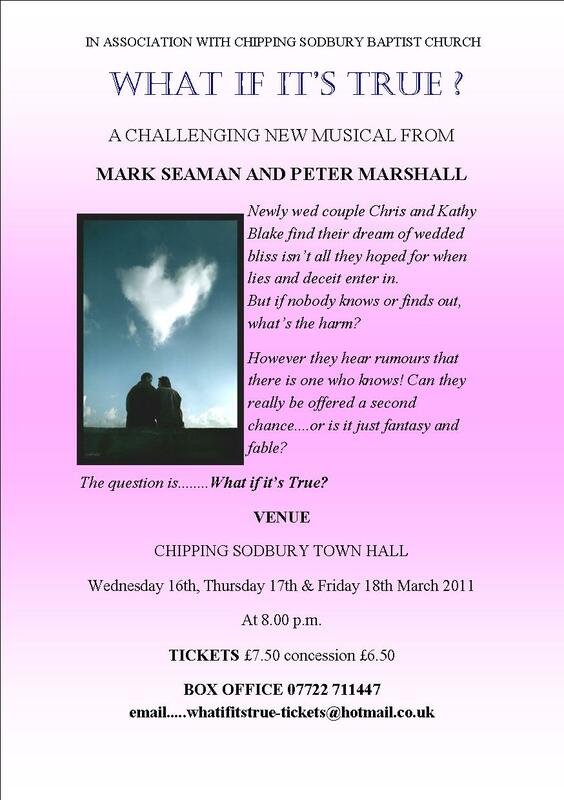 Mark directed this play to some acclaim at its launch in 2010 at The Alma Tavern Theatre in Clifton Bristol. Venue Magazine promised a show of rare quality in its review. Family Ties: Ted Porter is looking forward to celebrating his 60th birthday with his family. He joined the local mining company in his home town of South Yorkshire at the end of the war in 1945 as a sixteen year old, and worked there for the next forty years until taking redundancy following the miner’s strike in the mid 80‘s, and a downturn in his health. He is a proud man, well respected in the community, and much loved by his wife Doris who has supported Ted through thirty four years of marriage. They have two sons, both in their early thirties. 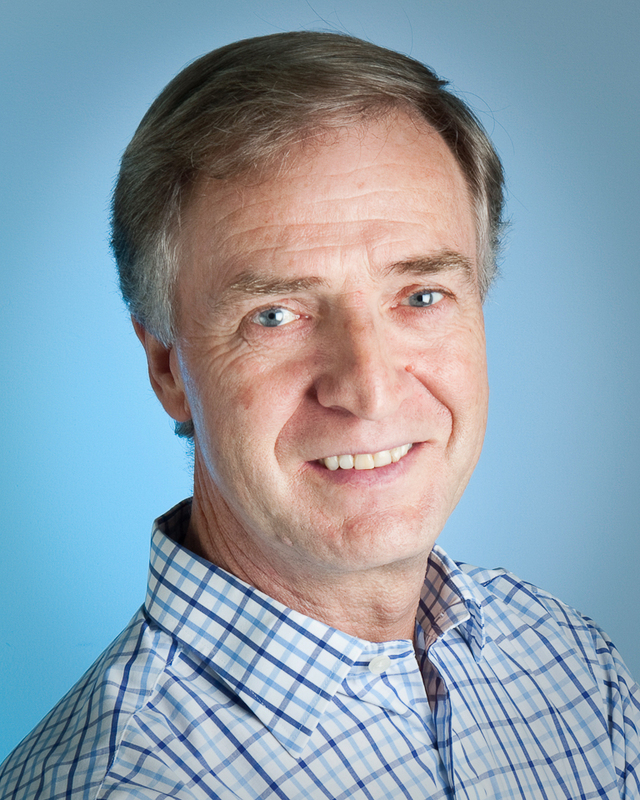 Ian is the eldest, and is married to Sally who is heavily pregnant with their first baby. He is also the local Church minister, and a great source of pride to both Ted and Doris who brought both boys up to attend the local Church in their youth. Their second son Paul lives in London and is a successful business consultant in the rapidly expanding world of computer technology. He has not always lived up to his father’s expectations, but Ted is grudgingly acceptant of the fact that his son has made his mark in life and appears to be happy, although they have had their differences over the years. Doris is excited at the prospect of having her family together for the first time in a while. However, the planned celebrations are rocked by an announcement that threatens to tear the family apart. This is a newly published three act play, and again promises to both challenge and entertain its audience. What If It’s True? : Newlyweds Chris and Kathy Blake embark on married life together with all its traditional demands. Like so many others, they feel that as a couple they are invincible and secure from the challenges and temptations of the outside world. For a while all goes well in their new roles of Mr and Mrs, eventually starting a family and not looking beyond their own immediate comfort and needs. However, when their relationship comes under pressure through Chris’s excessive drinking and infidelity the cracks begin to show. Following Kathy’s demand for change, Chris comes to realise they need more than just their own human resolve to get them back on track. Could God provide the help and answers they are looking for? They both heard the stories of Jesus when they were younger, and like so many others dismissed them as fantasy and fable. But what if he’s real, -“What if it’s True”? Other Plays and Pantomimes available directly from Mark. You and Me makes Three: Tony and Paul grew up as best friends with Tony acting as best man at Paul’s wedding to Kathy. The three of them formed a deep friendship and were inseparable for a while. After a few months of marriage Paul and Kathy had a major falling out, resulting in Tony and Kathy having a brief and secret affair, with Kathy becoming pregnant. Tony moved away, and Kathy and Paul got on with married life. However, following the death of Tony in a car accident some twenty years on, the events of the past return to both challenge and disturb Paul and Kathy’s seemingly idyllic life together. Bench Marks: A One Act play depicting the life, colour and events experienced in a single day on a park bench. The action takes place on or around a park bench in a public recreation area, and can be based in almost any town or city in Britain. The time is around 2006. Goodbye Bill: Bill Thompson died recently and has been “laid to rest” in a viewing room at the local Funeral Directors before his cremation service. However, Bill discovers that the life he presumed was over is actually only just beginning, and that there are outstanding issues from his former existence to be dealt with before he can move on. Feb 2012 production of "Babes in the Wood" by the Gunnislake Amateur Dramatic Society (GLAD) who commented that they "We're as pleased as punch to present the very first production of Mark Seaman's Babes in the Wood. The script was outrageously funny, full of puns, strong characters and plenty of action. It was hugely popular with our audiences who were full of praise for the very professional performances - achieved in no small part because of a clear, practical and polished script."